Cox DTC, Brandt MJ, McGregor R, Ottosson U, Stevens MC, Cresswell W. 2013. The seasonality of breeding in savannah birds of West Africa assessed from brood patch and juvenile occurrence. Journal of Ornithology online. Abstract. In order to maximise breeding success in a seasonally fluctuating environment animals breed during periods of increased resource abundance and avoid times of resource constraint. In tropical savannahs, variation in resources in time and space is dependent on the amplitude of the rains and their predictability. We quantified the degree to which tropical savannah birds have concentrated their breeding around predicted periods of increased food availability coincident with rainfall. We used the proportion of adults caught with brood patches and/or the juvenile-to-adult ratio in 25 species of small savannah bird which were caught over a 10-year period in Nigeria, West Africa, to assess the degree to which there were clear seasonal peaks in breeding activity. We found two-thirds of species bred in all seasons (68 %), but that most species showed distinct seasonal peaks (96 %) in the timing of their breeding. Over one-half of species (60 %) varied the timing of their breeding across the years. Granivorous species bred later than insectivorous and frugivorous species, which probably indicates synchronisation with their respective peak abundance in food type. Overall we found distinct seasonal peaks in breeding effort (i.e. breeding seasons), and this is most likely in response to changing resource availability brought about by seasonal rainfall. We also demonstrated the potential utility of using brood patches to test for patterns in breeding in multi-species long-term datasets. The authors estimated the seasonality of breeding in small tropical birds in the Amurum Community Forest Reserve, working out of the A.P. Leventis Ornithological Research Institute (APLORI), Jos, Nigeria. This forest reserve is characterised by very strong seasonality due to a single rainy season. 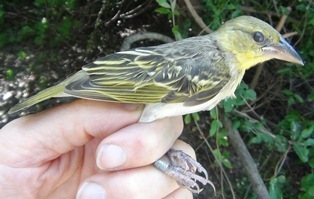 Birds were trapped using mist nets between January 2002 and November 2011 and 9228 individuals of 25 species were caught. Five weavers were included in this study: Village Weaver Ploceus cucullatus, Little Weaver Ploceus luteolus, Black-necked Weaver Ploceus nigricollis, Vitelline Masked Weaver Ploceus vitellinus, and Northern Red Bishop Euplectes franciscanus. Breeding was indicated in all seasons, but with peak breeding at the end of the wet season and the start of the dry season.